Well our farmhouse is coming along wonderfully! The trim is being installed and all that gorgeous trim work is being painted. 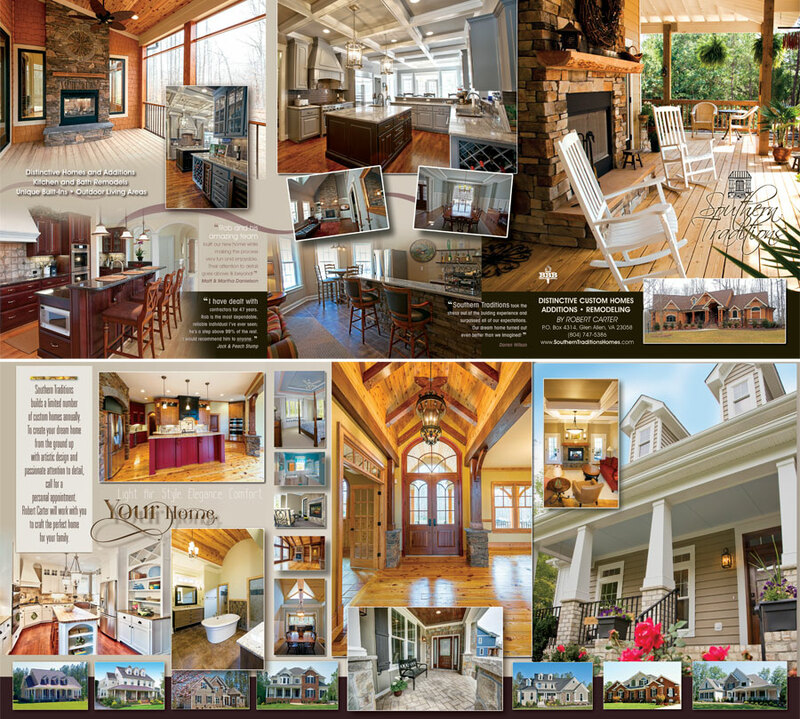 Just look at those curved beams! Our house will also have a hidden door which our very talented trim carpenters built this week. It is very cool. Can’t wait to “expose” the secret passage to you. The tile is also being installed. 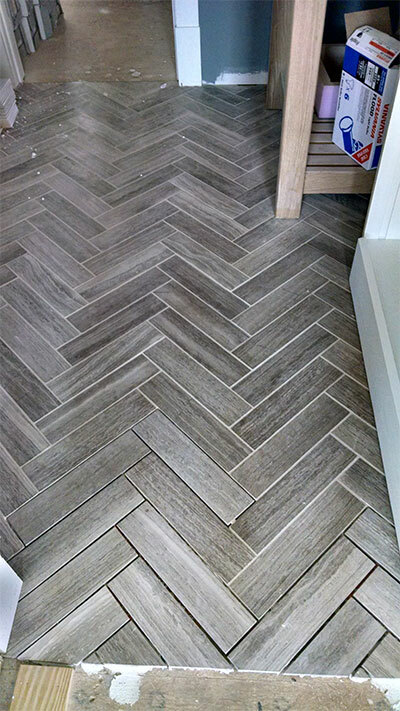 Check out this cool tile floor in our powder room. I really like the herringbone design. The granite and marble countertops have also been installed but are covered and being protected. (Along with a bountiful of construction comes a lot of dirt and grime. Can’t wait for a good cleaning.) One of our countertops will be made of concrete. Just wait for the unveiling! We have so many hard working and talented people working on our farmhouse. H.J. Holtz & Son (a local Richmond painting company since 1936) is doing some specialty finishes for us. They will be amazing. 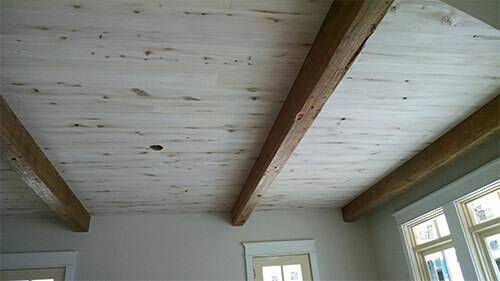 More pics to follow when completed but take a look at this weathered wood ceiling they painted in our dining room between the beams! They will also be painting a very special design on our library ceiling but it’s a secret for now. Stay tuned. 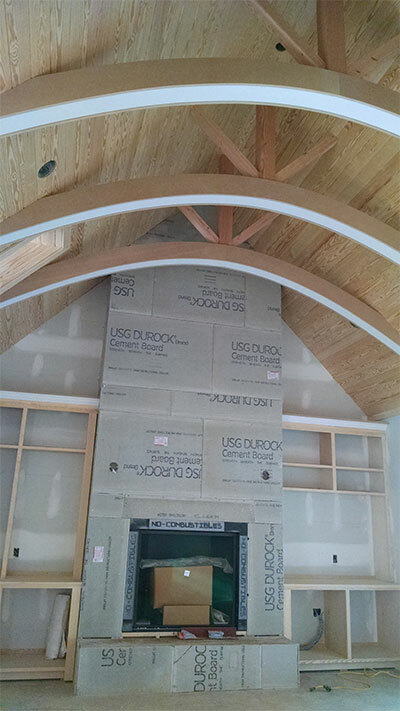 Our master bedroom ceiling will have a plaster finish compliments of the very talented Jeff who was working at Mt. Vernon last week! Twig is a fabulous, local Richmond shop on Lakeside Avenue. Jennifer Saunders is the owner and we are excited that Twig will be supplying some vintage and new home décor for our farmhouse. I am very excited about the lobster trap which will be used as a coffee table. 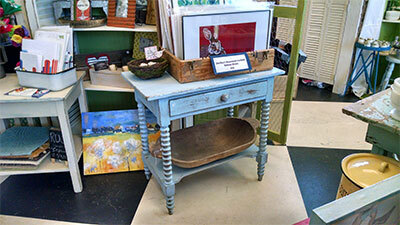 Take a look at this darling blue side table Jennifer is letting us use in the guest room. Of course, all of these adorable items from Twig will be on sale during the show June 3 – 19. It’s a great way to support local retail and local artists. Look at this cute painting? It will be displayed proudly in our farmhouse kitchen. 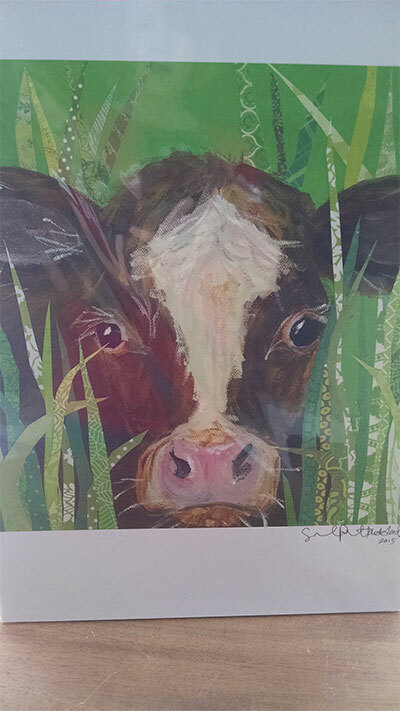 Nothing says farmhouse like a cow picture. I also promised you some of my favorite finds. Sarah Jane Studios is one of my new favorite websites. 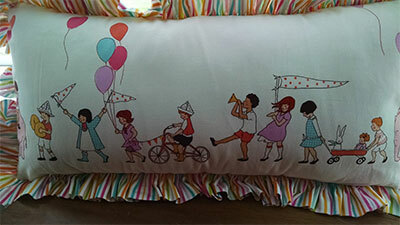 I bought several cute paintings and this adorable fabric which you can see I had made into a pillow for the nursery. 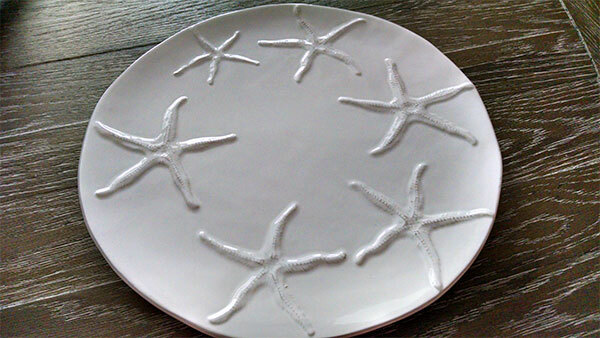 I just love this dinner plate I found for our dining room table. HomeGoods rules! Today, I visited our local tractor supply store. I wasn’t aware there was a local tractor supply store near Hallsley. I bought a very large galvanized tub which will be used for our dog wash station. Did I mention there would be a dog wash station in our garage? Lucky pooch! The tub is used to water livestock but we thought it might make a great dog wash tub. I actually enjoying shopping at the tractor store. Never thought I would hear those words come out of my mouth! I’m like a child waiting for Christmas morning. 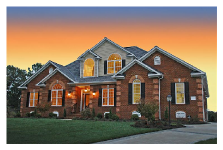 I’m so excited to decorate this beautiful home. The hardwood floors are being installed the end of this week. Furniture will be delivered early in May. I’m also looking forward to the upcoming landscaping and seeing those beautiful hydrangeas planted along the porch. My navy grasscloth wall paper is also being installed in early May. The countdown begins!